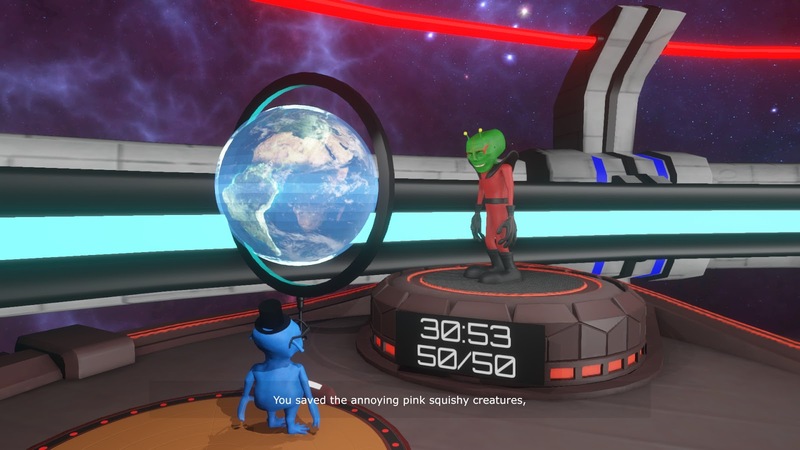 Doctor Kvorak's Obliteration Game is a third-person, 3D puzzle game where you direct three aliens called Greeboo, Micmac and Tiktok through a series of levels containing puzzles and traps; these levels are all part of an intergalactic game show hosted by a god called Doctor Kvorak. Depending on whether you choose to complete optional objectives or not, you can either doom planets to obliteration (hence the name of the game) or save them so they can be miniaturised and kept as part of Doctor Kvorak's planetary collection. The game seems to borrow elements from games like Portal (derisive host, multiple levels to solve, lots of crate puzzles, etc.) and The Cave (puzzle game requiring the cooperation of three characters to complete levels). The game also supports VR but since I don't have a VR headset I wasn't able to test the game from this perspective. Thanks to the generous folks at Freekstorm, I received a free review key for this game and that's basically how I got into it. 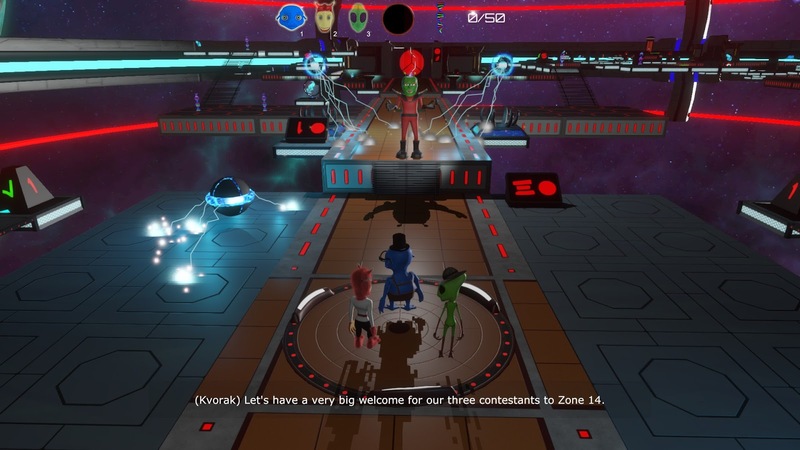 As you know, I don't normally go out of my way to acquire puzzle games but Doctor Kvorak's Obliteration Game seems to be one that is more to my liking as it bears some similarities to Portal which is one of my favourite games of all time. Sadly, no portal guns in this game though. 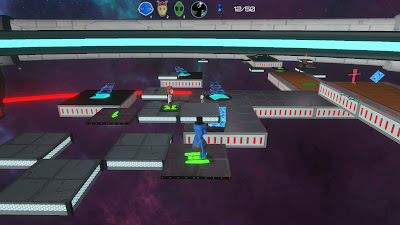 While on the surface the game is pretty linear you do get the choice of whether to save or destroy planets after each level: this is tied to how well you perform on the level with respect to collecting planetary fragments – collect them all and you save a planet of sentient beings; don't and you doom them to obliteration. The game has a happy ending which is miraculous in this day and age of darkness and grittiness. Okay, the game does talk about life and death a lot but in terms of actual violence, there's very little here besides aliens being shot by laser guns, electrocuted or falling into the abyss; each of these animations though don't show gratuitous violence so the game is probably ideal for kids aged 8+. Most of the game involves fairly easy levels that will take you 30 – 45 minutes to complete which makes it a relaxing, casual affair. *for the most part – except right at the end. Like Maniac Mansion (a game by Ron Gilbert!) or The Cave (also by Ron Gilbert! ), Doctor Kvorak's Obliteration Game requires cooperation amongst the alien contestants to solve the puzzles (at least in the latter stages of the game): one alien called Greeboo is able to place blue cubes on pressure plates, another alien called Micmac can walk through energy barriers and a third alien called Tiktok can swap positions with her alien comrades through teleportation. It's pretty neat and definitely something that makes this game stand out from the rest of the crowd. I did submit one bug report for the game with respect to one of the aliens getting left behind while using a double occupant teleporter, but so long as one of them manages to get to the next checkpoint, you're fine. Thankfully, this is the only real bug I could find and the rest of the game was a blissful, bug-free experience (except for the levels with the bug-like alien Tiktok of course). I haven't dabbled around with this yet but you can apparently create your own maps to share with the rest of the community; this should increase the game's replay value which is a big thumb up. Listening to the soundtrack is a nostalgia trip for me – it reminds me of lazy afternoons spent playing PC games in the 1990s. Not everyone is going to like the style (I mean who would readily admit that they like 90s dance music or synthpop nowadays?) but hey, I think the music is catchy and I want to get my hands on the downloadable MP3 soundtrack – once it's finally released (it's free with the game 😊). EDIT: Apparently this is not true. The soundtrack is actually available as paid DLC for $4.99 USD. I now have nightmares about this stage: 45 minutes to just get past this part! While the graphics are passable the game feels like it's a product of the 2000s and the blocky shadows don't help either. Also, the lip-synching seems a bit off too. On some levels, aliens dying don't seem to reset puzzles; on others, it does. This may tie in with the de-activation of their abilities (Greeboo being able to place blue cubes onto pressure plates for example) but there doesn't seem to be any rhyme or reason to it. Also, on some levels once you've unlocked a door it stays open while on others you actually need an alien or an object to be sitting on a button continually in order to keep the door open. Also, either triggering checkpoints or dying would sometimes cause doors behind you to lock closed while other times it wouldn't. It's a bit confusing and maybe it's all part of the game (or Kvorak's devilish humour) but it does mean the game can get frustrating at times as you can't plan ahead. The controls are not customisable and when you look up the controls it actually opens a separate webpage. Why can't they just be a part of the game instead? If you can overcome the annoying game show host (Doctor Kvorak himself) and the fact the game isn't going to be a cakewalk at the end (despite the previous 90% of it being exactly that), there's a fun, well-polished, family friendly puzzle game to be played here along with a catchy soundtrack to accompany it. There's even a stronger case to buy this game if you've got a VR headset or you're into designing your own levels and sharing them with the community. Is the game worth $19.99 USD? : Yes, but only just. The game is the same price as similar games Portal 2 and Antichamber and Portal 2 is admittedly a tough act to beat. However, when you buy this game you do get the soundtrack included for free and if you have a VR headset then it would represent even better value.